At the heart of the Cathedral’s worship is music performed in the English Choral Tradition, a beautiful and uplifting experience accessible to both regular worshippers at the Cathedral and to visitors. However, the Cathedral’s rich musical tradition is sustained without the fee-paying Choir School found at many other cathedrals. The Boys’ and Girls’ Choirs are open to any boy or girl who demonstrates the musical ability required through open audition. They come from different social and ethnic backgrounds, and different schools, both state and independent. Membership of the Choirs is free; the Choristers receive an excellent musical education that their parents may not otherwise be able to afford. However, the costs of the Choirs to the Cathedral are considerable, approximately £170, 000 per year, including the salary costs of the Director of Music and the Director of the Girls’ Choir, the costs of the Lay Clerks, travel costs, costs of foreign tours, laundry of robes and refreshments. 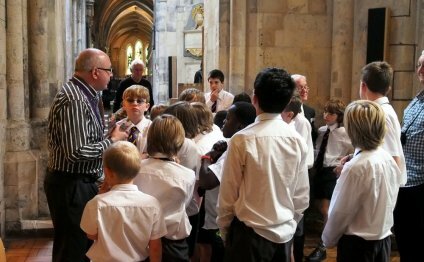 The Cathedral seeks financial support for the Choirs in order that the worship held at the Cathedral continues to be enriched by music, and that the Choristers may continue to receive excellent musical training at no cost to their parents. Through the St Mary Overie Appeal, which is led by Dame Mary Archer, the Cathedral seeks to place the Girls’ Choir on a sure financial footing. The Girls’ Choir is the only Anglican cathedral girls’ choir in London. It sits at the heart of the Cathedral, singing Choral Evensong every Monday and alternate Thursdays, as well as at many special services and events. It performs to an outstanding standard. Like the Boys’ Choir, it has made recordings and broadcasts, performed at the Royal Albert Hall, and taken overseas tours. Donations are requested in order that it may continue to make its unique contribution to the life of the Cathedral. The cost of supporting one girl for one year is £1, 000. Donations of £3, 000 and £5, 000 would ensure longer term support over three and five years respectively. Please click on the donate button below to give your support. The dedication to St Mary Overie is first a dedication to the Virgin Mary, and the name Overie means Over The River. A religious building has stood on the site of Southwark Cathedral for some 1400 years: according to oral tradition a House of Sisters (nuns), dedicated to the Virgin Mary was founded in 606, but was moved some two centuries later by St Swithun, Bishop of Winchester and an Augustinian Priory was founded in its place. The name Overie (Over The River), comes from the site’s origins as the oldest crossing point of the tidal Thames, at was the only entrance to the City of London across the river for many centuries. St Saviour's Church became the Cathedral for the newly formed Diocese of Southwark in 1905 and for many years has had a fine Choir of boys and men. The Boys’ Choir sings the Choral Eucharist and also Choral Evensong on Sundays, and sings Choral Evensong on Tuesdays and Fridays. It has become well known through broadcasts, overseas tours and recordings. The boys sing to a very high standard and their repertoire spans music from plainsong to music composed in the present day. Please click on the donate button below to give your support.